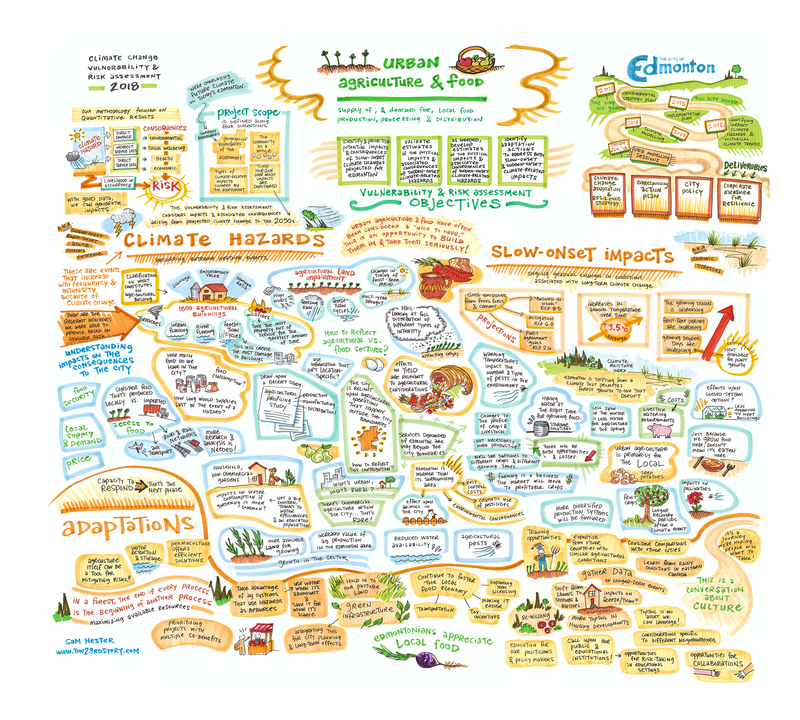 In January 2018, subject-matter experts were invited to attend one or more of 10 workshops designed to assess the vulnerabilities and risks that Edmonton could experience in a changing climate. Through these workshops, 17 assets and service areas were considered in relation to climate hazards (that is extreme heat, extreme cold, hail, and so on). 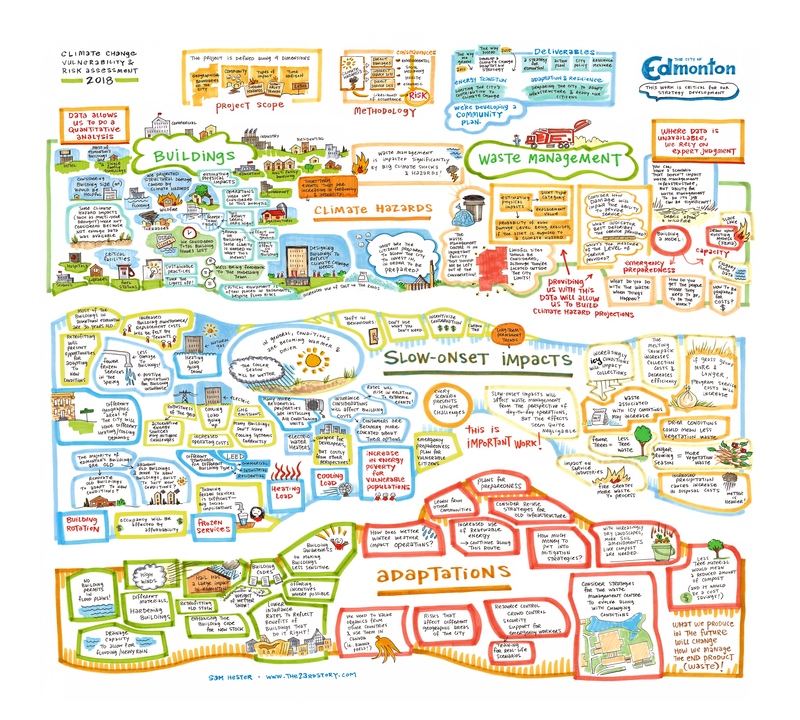 At the workshops, conversations and ideas presented by participants were captured by a graphic artist. Click each image to see a larger version. 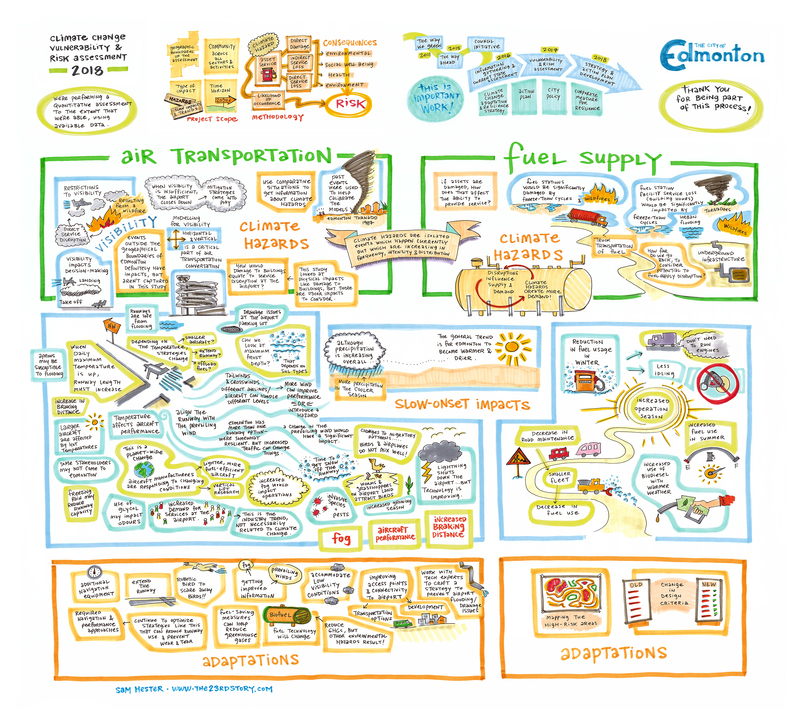 This combined session looked at both the impacts climate change could have to Edmonton’s air travel through the Edmonton International Airport, as well as the impacts climate change could have to Edmonton’s fuel supply, including fuel supply for industrial, commercial, and public end users. During this session, subject matter experts discussed climate change effects on commercial, residential, industrial and public buildings, as well as land and property. Assets required to collect, treat and dispose of Edmonton’s solid waste were also discussed. Economy and Community and Culture was a combined workshop. Economy was discussed in the context of the production, distribution and consumption systems that generate and retain wealth in Edmonton. Community and Culture considered heritage, cultural, social and amenity aspects of the community that affect the well-being or quality of life of residents. 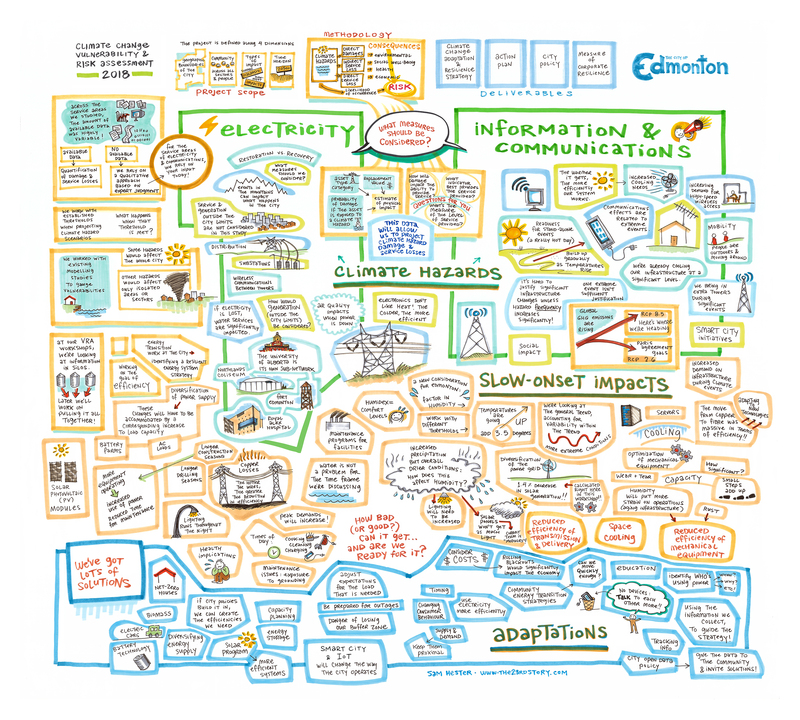 Electricity and information communications technology was discussed to assess the resiliency of these systems in light of climate change. Electricity included looking at the electrical transmission and distribution system and information communications technology looked at this system’s network including telephone lines, cables, fibre-optics and other related infrastructure. 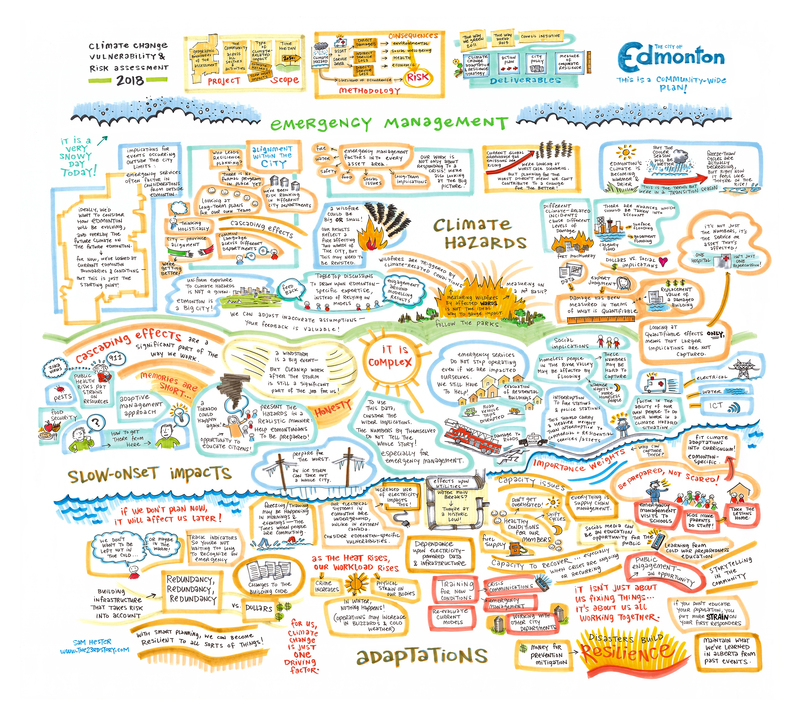 While emergency management is a cross-cutting theme across all areas affected by climate change, a separate emergency management session was held to discuss what climate change means for emergency management services, including preparedness, response and recovery. 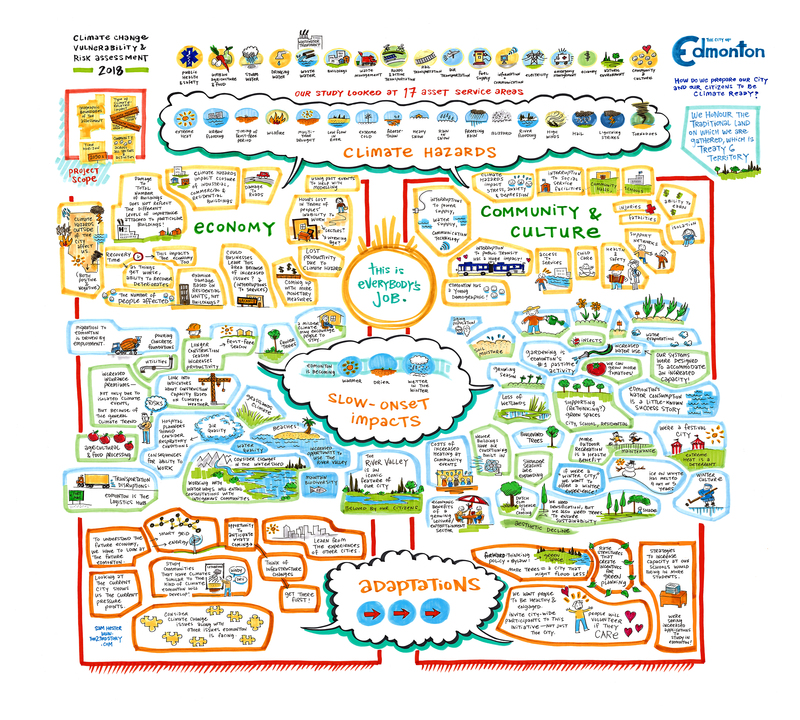 Climate change has the potential to affect our natural environment and ecosystems. 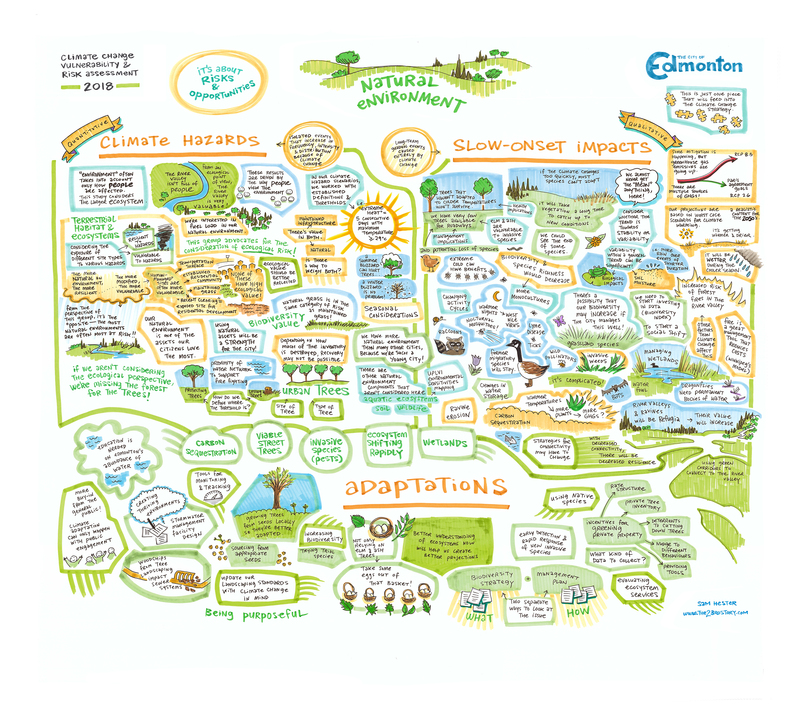 In this workshop subject matter experts looked at what this may mean for Edmonton’s terrestrial and aquatic habitats and ecosystems, our large expanse of urban forests, and managed areas such as parks. 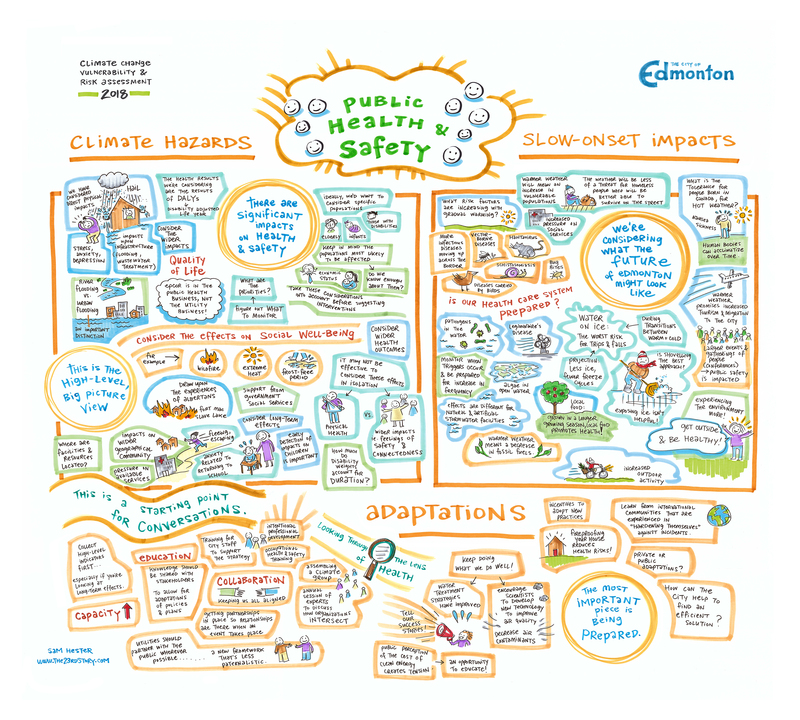 This session looked at what climate change could mean in terms of the physical and mental health of Edmontonians, including both mortality (length of life) and morbidity (quality of life) health outcomes. 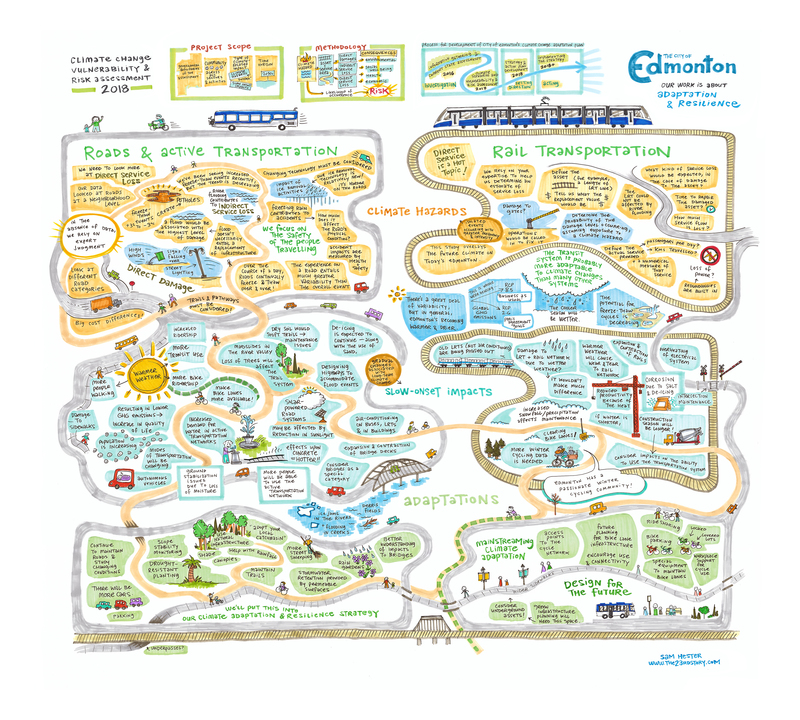 This combined transportation session looked at what climate change could mean for the different ways Edmontonians travel around our city. This session discussed agricultural buildings and land that support local food production, processing and distribution, as well as products sourced from within Alberta that supply Edmonton’s agricultural value chains. 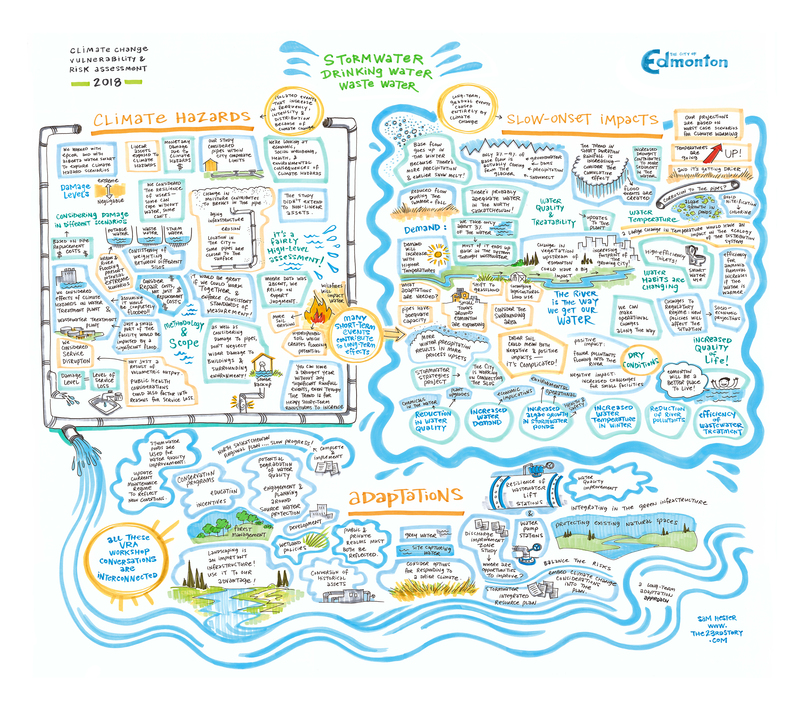 This session discussed how climate change could affect different aspects of Edmonton's water system, from potable drinking water, stormwater management and our wastewater management systems.